This site was launched in april, 2007. Here you will find facts, photos and videos of spiders, arachnids and other creepy crawlers. 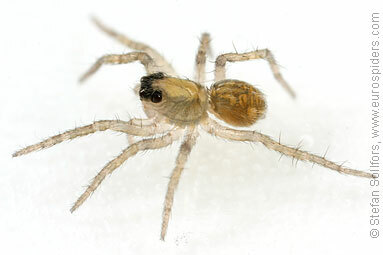 Eurospiders.com is a site with 2050 close-up photos and facts about spiders found in Europe. The main focus of the site is to show close-up photos of European spiders, but there will also be some general spider facts and photos of other arachnids. Pardosa amentata, 10 aug 2014. Xerolycosa nemoralis, 10 aug 2014. Philodromus margaritatus, 10 aug 2014. Theridion varians, 10 aug 2014. Micrommata virescens, 30 jun 2014. Theridion impressum, 30 jun 2014. Araniella cucurbitina, 30 jun 2014. Philodromus cespitum, 30 jun 2014. Amaurobius fenestralis, 30 jun 2014. Tetragnatha montana, 30 jun 2014. Metellina merianae, 30 jun 2014. Microlinyphia pusilla, 29 jun 2014. Steatoda bipunctata, 23 jun 2014. Myrmarachne formicaria, 16 jun 2014. Araniella cucurbitina, 6 jun 2014. Theridion sisyphium, 31 may 2014. Keijia tincta, 19 may 2014. Stroemiellus stroemi, 11 may 2014. Phrurolithus festivus, 4 may 2014. Hypomma bituberculatum, 1 may 2014. Misumena vatia, 8 aug 2014. Steatoda bipunctata, 18 jun 2014. Dolomedes plantarius, 25 jan 2014. Zygiella atrica, 16 nov 2013. Araniella cucurbitina, 5 oct 2013. Steatoda albomaculata, 12 aug 2013. Nuctenea umbratica, 1 apr 2013. Agelena labyrinthica, 12 jan 2013. Araneus quadratus, 25 nov 2012. Hyptiotes paradoxus, 19 aug 2012.
but feel free to link to individual pages. I am a photographer, not an arachnologist. Although I spend a lot of time on spider identification, I can not give a 100% guarantee on the id of the spiders.